After stamping in Versamark, using the heat gun and then inking the images with various colors, I die cut the image with the Stitched Square Stacklets and then layered it onto Granny Smith Cardstock and the Cookie Monster cardstock. I added some white Pico embellisher dots (Wedding Cake) and some clear dots (Shimmer) to the image panel, as well as some dots lining the card. I just love how this turned out! 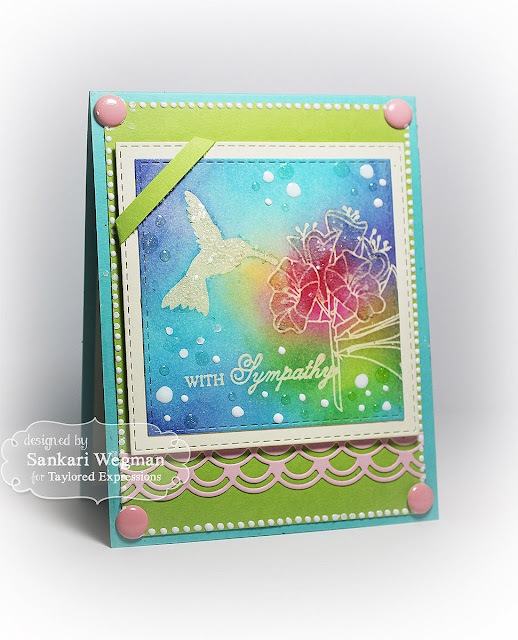 I loved learning this technique and hope you enjoyed this card - let me know if you try it - would love to see your creations! What a great result, especially for your first try. It's one of my favourite techniques that I use a lot. I like how you added the scallops below your pretty technique part. So pretty Sankari!! Love the colors!